February 19, 2012. Steve Ludwig checked in as the new owner of #80. He bought her from Buck Owens. Click here to go to #80's new page. This is the history we have on this boat. October 20, 2007. Buck Owens checked with the following email. 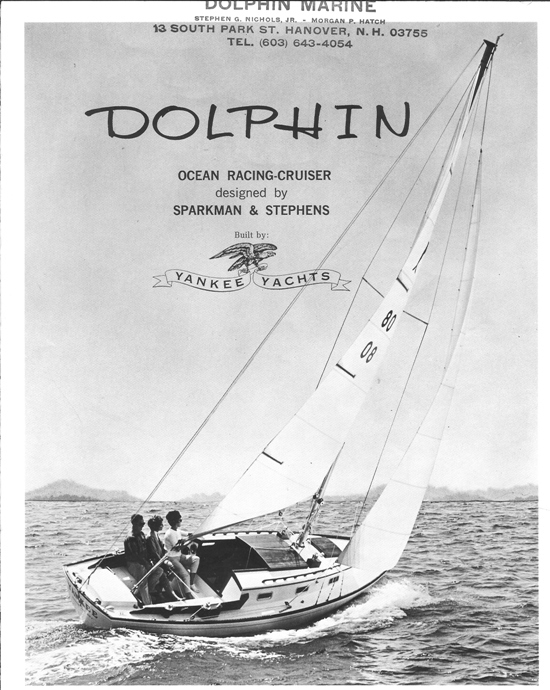 His boat was the cover boat on Yankee's first Dolphin Brochure in 1967 (above). He expects to be in the water in 2 weeks after an extensive rebuild. Webmaster Note October 26, 2015 - For more on this brochure, click here. I found your web site the other day - looks great! I have a Dolphin #80 that I have rebuilt and will be sailing in a couple of weeks. There is also another Dolphin here in Humboldt Bay, California a few years newer. In October 6, 2009, while looking for a Dolphin 24 for him and his father to buy, Joe Sharpe found their old boat. Years ago they had one in Eureka, California named El Gitano. He also found a couple of other Dolphins in this same area. Here is an email (minor edits) we received from Joe regarding our inquiry about this boat. I'll check to see if my dad knows more. As I recall, she was a Yankee Dolphin, unknown hull number, green trim on white hull, with an interior very, very similar to Yanqui on the for sale page (including the table with chart set into it). It is apparently still in Eureka, CA (we're in Oregon now). We're going down for a wedding in a couple weeks and plan to look for her. I'll snap a photo. Joe has also discovered at least one other newly found Dolphin and has truly earned his DFI badge (Dolphin Field Investigator). We have set up new pages for these boats. Click on the links below to go to them. Joe sent in a couple of emails which have been consolidated and edited. I found three Dolphins in Humboldt Bay. Sorry this took a couple weeks; our trip to Eureka was followed by one to Maui. Different weather, same ocean. 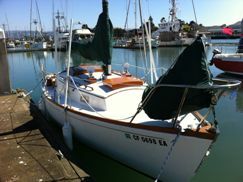 The one for sale at Eureka is indeed El Gitano, confirmed by repairs my father had made. The name had been removed and not replaced. I have a video my wife shot as we looked at the boat, but remarkably enough I neglected to take a single photograph. The internet ad for the boat is (http://www.sailboatlistings.com/view/19565). There are some problems with the image that make the hull look grey, which it's not.The current owner is asking $7500. If anyone is interested in a more thorough description I can give them one or email the video - at over eight minutes long, it's kind of huge. The third boat, whose name I couldn't see from the dock, reg number CF 0698 EA, is at Woodley Island Marina - just over a short bridge from Eureka. Webmaster note: We'll call this boat 0698 Eureka until we find out more. Click to go to her. Here is the ad for #80. Nice Sparkman & Stephans classic. Runs and sails great! new vhf new xm radio with ipod connection And all the stuff to go sailing. A few days ago the Sharpes finally did find a Dolphin, Rick Englar's Yanqui in Benecia, CA. When the weather clears they will trail her up to Portland.